Wireless Theatre Company have contacted me with the exciting information that Series Two of the popular Springheel Saga, entitled The Legend of Springheel’d Jack, will be released online on 6 December 2013. In the meantime, here is a review of Series One to whet your appetites. Wireless Theatre Company’s take on the Spring-Heeled Jack story is an atmospheric, exhilarating, beguiling piece of radio drama. The writers have taken the known facts of the case and expertly weaved them with a story of devil worship that appears to pay homage to “The Daemons” (the Jon Pertwee Doctor Who story from the 1970s). Doctor Who influences are everywhere, from the opening music (which also strangely reminds me of “Dallas”), to Julian Glover’s participation as Lord Wayland, to the fact that the lead character is called Jonah Smith. The eagle-eared among you will spot other parallels as you listen, but I wouldn’t want to give everything away! The writing is greatly assisted by the sound in all three episodes. Both Francesco Quadraroupolo’s music and Andrew Swann’s sound effects help to build the atmosphere to the point where you can almost see what is going on. I could easily imagine myself in Victorian London, and the devil worshipping ceremonies were particularly effective. Of course, this is also largely due to the quality of the acting; the way that everything is edited together (Andrew Swann again) and the overall production values of the serial. With a cast of 23, it is impossible for me to mention everyone, suffice it to say that all should be extremely proud of their performances. Christopher Finney and Matthew Jure gave strong, believable, sympathetic performances as Constables Jonah Smith and Toby Hooks respectively, as did Jessica Dennis in the lead female role of Charlotte Fitzrandolph. All of the female characters were played very well – I particularly like landlady Mrs Bairstow, played in an amusing and entertaining manner by Lizzie Goodall. Julian Glover was a marvellously nefarious villain, and Jack Bowman did a wonderful job of portraying the evil and menacing Mr Chough. 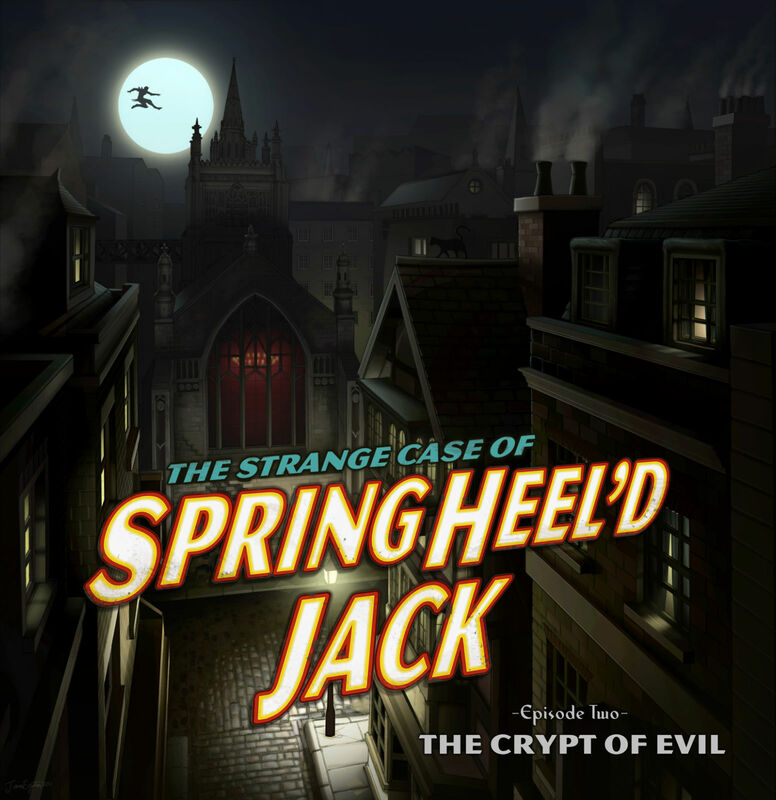 The Strange Case of Springheel’d Jack is in three episodes: The Ghost of Clapham Common; The Crypt of Evil and The Face of the Fiend. Each of these can be downloaded free from www.wirelesstheatrecompany.co.uk. Further episodes are promised, which I, for one, shall certainly be on the lookout for! First published on Blogtor Who. Passing By begins, deceptively, with a one-night stand. 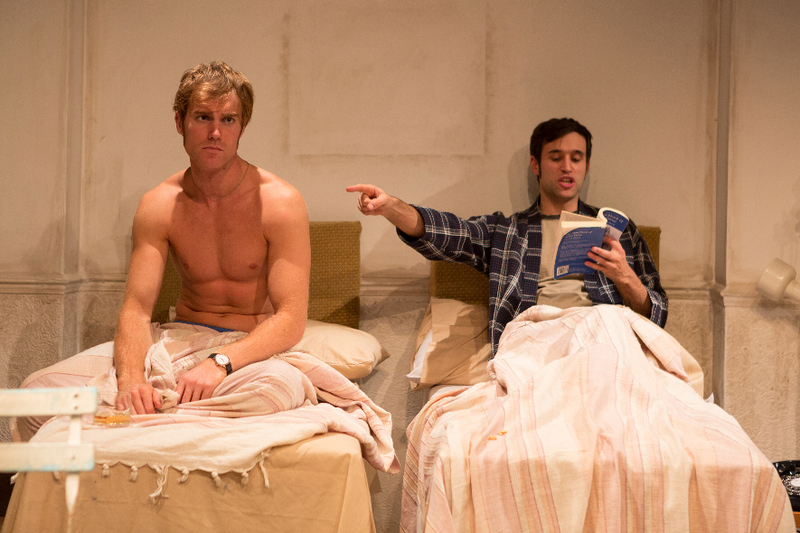 A one-night stand that turns into eight weeks and becomes the substance of the play. Thrown together by circumstances, the two main characters have intensive intimacy forced upon them, which leads to both comic moments and personal revelations. It is almost like a bubble of unreality, in which normal life is suspended for a period of time. Naturally, all such bubbles eventually burst. Toby and Simon meet at the cinema, and then return to Toby’s apartment. Simon has just arrived in New York from Miami Beach. The following morning we hear that Toby is about to leave for Paris, so their relationship seems doomed to be a brief one. Nevertheless, Simon turns up at Toby’s place of work (a wine shop) several days later, and a subsequent discovery of mutual illness, coupled with the fact that Simon has nowhere else to stay, causes them to nurse each other back to health over the next 8 weeks. This is a well-written, carefully-structured, balanced play. It has overtones of the type of New York humour found in Woody Allen or Neil Simon, and the contrast between James Cartwright’s portrayal of Olympic diver Simon, and Rik Makarem’s New York Jew Toby adds to the richness of the mix. Simon is laid-back, confident, physically fit and has never had a day’s illness in his life (until now), whereas Toby is nervous, neurotic and seemingly hypochondriac at the start of the play. Both actors filled their roles extremely well. I couldn’t fault the accents, and James Cartwright’s initially relaxed Simon was a good foil to Rik Makarem’s anxious Toby. However, it was as the play progressed and the roles reversed that the actors came into their own, and the interplay between them was excellent. The juxtaposition of characters was what made the play, and, to me, was reminiscent of many wonderful similar stories: The Odd Couple; Prick Up Your Ears and even Ernie and Bert! The resemblance to both the Joe Orton story and the Sesame Street roommates was enhanced by the set (presumably designed by Philip Lindley). The majority of the play is set in Toby’s bedroom/kitchenette, which is a very good simulation of a 1970s room, with nylon bedspreads, padded headboards and an old-style black dial telephone. The only false note was a television remote control of a type not in common use until the early 90s – a bit of an anachronism for 1972. The three other short scenes – in the wine shop; at the cinema; on a bench – were very cleverly fitted into the main set. The interesting thing about watching a play which was actually written in the early 70s, rather than one written today looking back at the period, is that there is no benefit of hindsight. There is no dramatic irony, apart from that which the audience themselves experience, and the writer had no knowledge of the vast changes which were to take place in the lives of gay men in New York and elsewhere over the next couple of decades. This gives a purity to the piece, almost as if we were looking through a window in time and space, that you just don’t get with retrospective writing. For this, and for many other reasons, I would recommend you catch this play – as it is passing by. Passing by is at the Tristan Bates Theatre in Covent Garden until 30th November, nightly at 7.30, tickets £14 (£12 concessions). For booking or more information visit www.tristanbatestheatre.co.uk or telephone 020 7240 6283. Photos by Scott Rylander.